Each year, in the last few days of November, the world of radiology descends on the city of Chicago for the annual meeting of RSNA, the Radiological Society of North America. There are 60,000 delegates to the meeting, a third of them radiologists, and many who travel from outside North America to find out what is happening in their field. Although almost a thousand companies exhibit their imaging systems, while using the opportunity to launch new products, the major focus of RSNA is on clinical research findings. It’s where the radiological community gathers to learn about the latest developments. Functional information comes from nuclear medicine (or radionuclide) images, which includes positron emission mammography (PEM), breast-specific gamma imaging (BSGI), and molecular breast imaging (MBI). The common thread running through these techniques is an injection, into the woman’s bloodstream, of a radiopharmaceutical agent with the image captured by specialized detectors. The nuclear medicine imaging modalities were also the focus of a special course at RSNA this week. A group from the Mayo Clinic in Minnesota presented their findings on using MBI to screen for cancer in patients with dense breasts. They found a significant increase in sensitivity compared with standard mammography even when the dose of the radiopharmaceutical agent was reduced substantially. Of course in a screening environment, there is the added cost of the agent, plus the time to gather the images, that have to be taken into account. 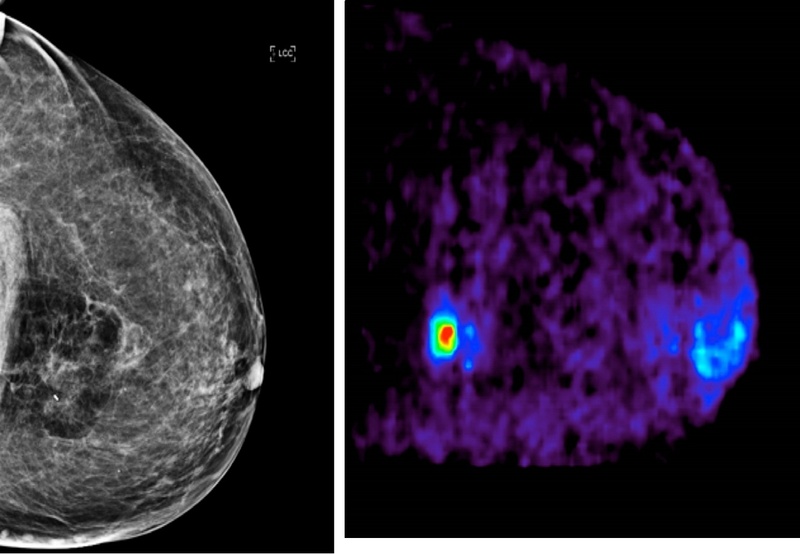 A patient with a small tumour seen in the mammography image on the left, compared with a colour-coded PEM image on the right. Images are courtesy of Dr Roberto Valdes of the Netherlands.